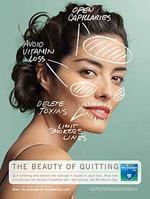 Instead of harping a self-righteous "smoking kills" or "quitting can improve your quality of life" message with some skipping in the flowers imagery, NicodermCQ takes a different tack: it hawks its nicotine patch as an age lifter and clarifier. Clever. We all know what the detriments associated with smoking are; the only problem is that tools for quitting just aren't as cute as the sultry puff-puff. Considering some women already use a patch for birth control, looking upon a nicotine patch as a beauty tool may be just what the doctor ordered. The iPhone. It Does Everything! It's a camera. It's a movie player. A bottle opener. An electric razor. A mousetrap. Lip gloss. A condiment dispenser. A cheese grater. A treadmill. A children's thermometer. A portable shower. Sideburns. And a condom. Know what it is yet? It's an iPhone spoof courtesy of Conan O'brien. Yes, the much-rumored, yet, if ever, to be released Apple iPhone is the star of this send up of all gadgetry that rules our lives today. Shedwa points out there's a green 50-ft idol floating around the Hudson River this morning. 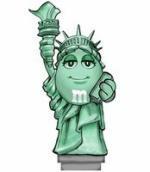 Much evolved from the days of the golden calf, idolators these days favour the Lady Liberty-styled M&M. Come full circle in your worship at Become an M&M, where you can create an M&M avatar with vestiges of you. To really get in the mood, we recommend shoving a few of the peanut butter persuasion into your mouth before zipping off with that mouse. MIT Advertising Lab writes "Can't believe I beat Adrants to a post with a semi-naked woman peddling a product, but here it is." Unfortunately, we are both six months late featuring the bikini-clad Carmen Elektra whose bulging breasts far exceed the capabilities of her cherry designed top while she poses with a bottle of Coke. What does this have to do with advertising? Absolutely nothing other than to combat the dearth of featured flesh here on Adrants. Drool more here. Letters of complaint can be addressed to toomuchsalaciousfleshonadrantsthatbelittleswomen@adrants.com. We've never been huge fans but Mr. Peanut gets just due for being a longtime symbol of good clean fun in a mixed nuts can. That's why we're sad to be the ones to tell you how easily the 'Nut's integrity can be compromised. Word on the street is Kraft had Draft FCB run an online vote to freshen up the Mr. Peanut look. Small changes: pocket watch, yea or nay? Cuff links, too Chippendale? But apparently Kraft had a panic attack and made everyone in the Company and at Draft stuff the ballot to ensure Mr. Peanut remains the same stodgy, phallic eyepiece-porting womper he's always been. If only for the FAQ section, you should check out this HP Digital Entertainment site - created by Source - promoting the company's televisions. yes, we had no idea the company made TVs either. The section is of the usual click and chat variety but the fun picks up in th FAQ section, the area most sites simply serve up dry answers to dry questions that aren't the ones you were interested in anyway. Here, HP has fun. Or as much fun as a conservative company like HP can have without taking its clothes off. The section serves up the answers game show style and the talent selection Source made was a very good one for this effort. This Blistex ad features quirky animation and short, satisfying sound effects. More importantly, it presents the perfect excuse to showcase the spankin' new website for Toronto-based Head Gear Animation, featuring a fresh series of weird bite-sized cartoon campaigns with every reload. Think Sick Animation but tamer, though after close consideration both serve nearly the same purpose as Head Gear pushes products and services and, these days, so does the once too-cool Sick Animation. Ah well. We all have to sell out to cash in. Adrants reader Marsha suspects marketing dollars behind this new life for sale on Ebay, where flaxen-haired Nicael is selling his identity to the highest bidder. We don't, but we suspect they'll find their way to him soon enough. The new life includes inheritance of love interests, friends, belongings and nemeses (two). It also includes extensive training for skills (including fire twirling), appearance, and stories from his past, as well as tech support once training's through. Can you imagine tech support for your own life? "Just ignore the hairy douche who comes to the door periodically. He claims to want the rent but he's not a landlord. And the girl at the cafe? You've been working on nailing her for weeks. Please do in the next two in a half weeks." 30% of profits from the sale go to ARAFMI. You can check out the requisite Myspace here. If we could sell our lives for every morning we woke up feeling less-than-snarky, and receive upwards of $30,000 for it, we'd probably be ... well, we don't know, because we wouldn't be us. Like Nicael we'd probably just choose somewhere to brood. Apparently, the streets of Milwaukee are vry dirty in Winter and a recent bank transit campiagn has taken advantage of that fact. For North Bank, Stir created several bus boards that appear dirty and have messages scrawled on the boards similar to scrawling a message on the back of a dirty car or a foggy window. The messages are responses to the boards' headlines that reflect what people might say after reading the headline. Our fav is "We don't hide fees" followed by "Does that cost extra?" See them all here.